The Daring Bakers challenge for April 2008 was cheesecake pops chosen by Elle of Feeding my Enthusiasms and Deborah of Taste and Tell. It is a rich, delicious, creamy cheesecake recipe. The recipe makes a 10-inch cheesecake and it makes a lot of pops! I used a #30 scoop, and made about 40 delicious pops. 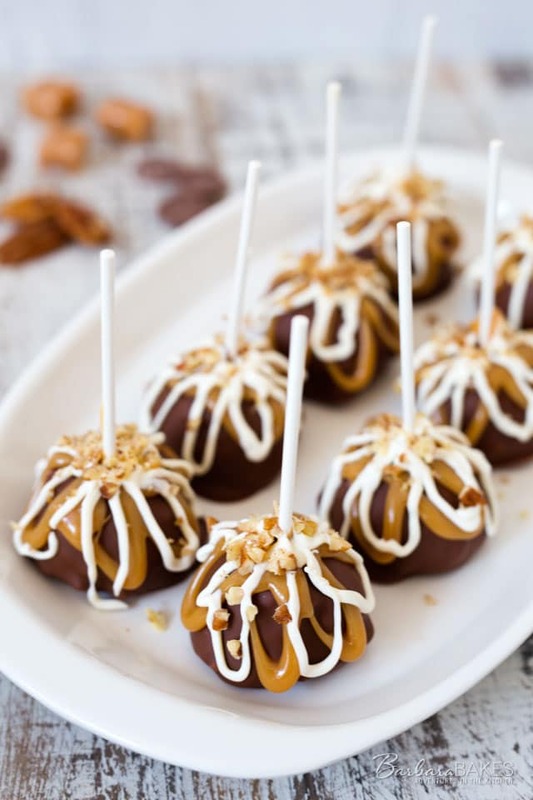 Decorated caramel apples were my inspiration and I drizzled them with caramel and white chocolate. 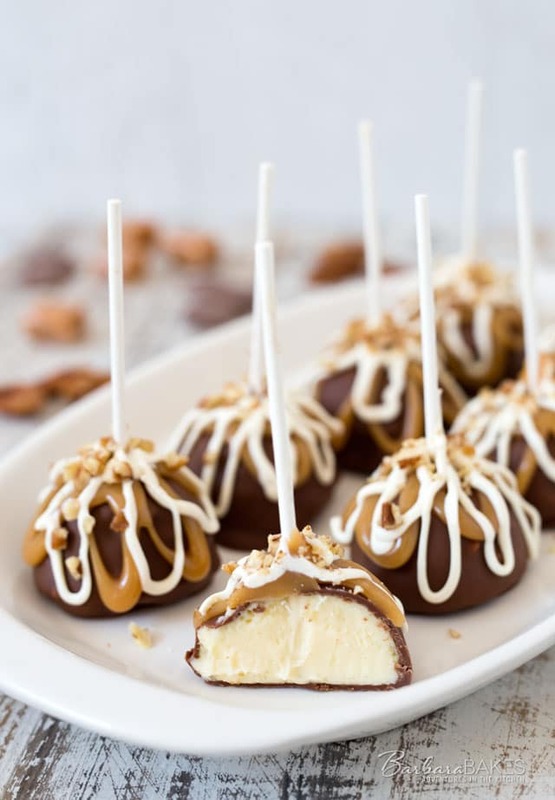 These cheesecake pops were a big hit with my family and neighbors. In fact, my neighbor requested them for her birthday the following year, and ever year since that first year in 2008. Since it was her birthday month again, I decided it was time to update the post with some better photos and share them again. If hope you’ll give them a try. They would be a perfect Valentine’s Day dessert. Grease a 10-inch cake pan (not a springform pan), and pour the batter into the cake pan. Place the pan in a larger roasting pan. Fill the roasting pan with the boiling water until it reaches halfway up the sides of the cake pan. Bake until the cheesecake is firm and slightly golden on top, 45 - 55 minutes. Remove the cheesecake from the water bath and cool to room temperature. Cover the cheesecake with plastic wrap and refrigerate until very cold, at least 3 hours or up to overnight. When the cheesecake is cold and very firm, scoop the cheesecake into 2-ounce balls and place on a parchment paper-lined baking sheet. Carefully insert a lollipop stick into each cheesecake ball. Freeze the cheesecake pops, uncovered, until very hard, at least 1 – 2 hours. These cheesecakes look awesome, and your photos are gorgeous, Barbara. 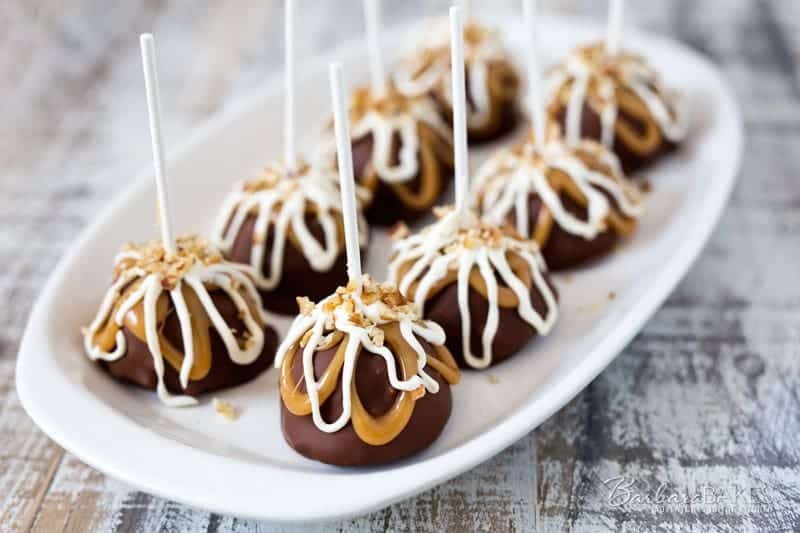 Oh Barbara…these cheesecake pops look awesome…I love the chocolate cover and the caramel drizzle…awesome! Thanks so much Juliana! They’re fun to make too. These are amazing cheesecake pops- probably the best I’ve ever seen! Love the caramel drizzle on top. Your photos are gorgeous Barbara!! That’s so nice – thank you!